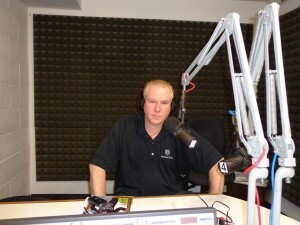 The Gog Blog Chicago’s #1 Online Golf News Source by Rory Spears, Editor and Director of Content. Follow Rory on Facebook, Linkedin and Twitter @GogBlogGuy. 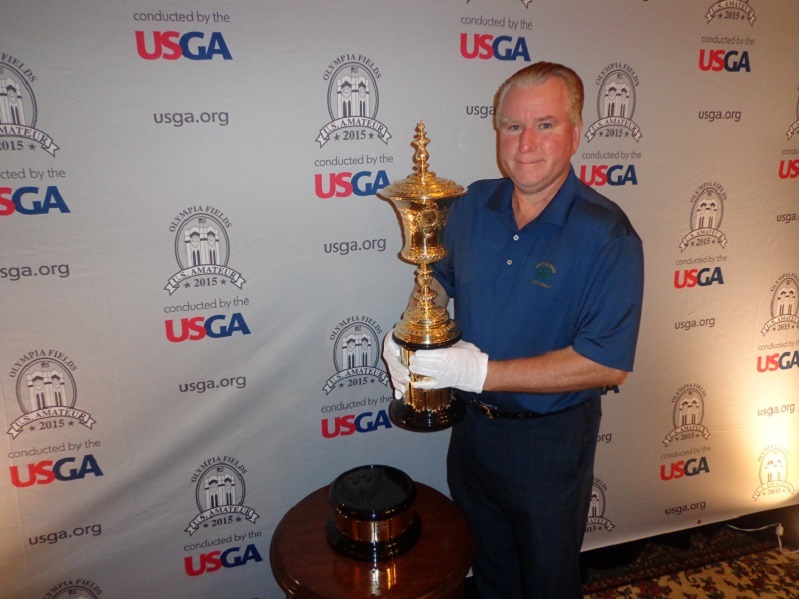 With the US Amateur trophy the Havemeyer at Olympia Fields Country Club. As we say good-bye to 2015, it’s time to take a look back at the year in golf that it was. A good year at that, especially here in Chicago, where continues to keep rolling in right direction. In recapping the year in my eyes, it started for me like it did for everyone back in January. If I wasn’t in the dome, I was getting ready to depart for the PGA show in January. For the second straight year my first of golf was played at the Kinderlou Forest Golf Club in Valdosta Georgia. Kinderlou is a solid course, and one I recommend golfers try if you are in Southern Georgia, you can go wrong. It’s a Davis Love III and Bob Spence design, the villa’s on the course are fantastic as well. The PGA merchandise show started off with the bad news that Daily Herald writer and golf guy Mike Spellman, it hit all of us from Illinois at the show. The highlight was getting fitted for a new Titleist 915 Driver, which was a good move as my season went on. February saw our Chicago Golf shows in Tinley Park and Rosemont help launch the golf season back here in town, both show had good turnouts, and hopefully more of the same this season. In March I discovered golf in Mississippi, around the Biloxi area and came away impressed with the courses there. It’s an area I hope to return to in the near future. If you have not been there you need to go. The April highlight was watching Jordan Spieth win the Masters, along with the return of Golfers on Golf Radio. Our radio show had it’s longest and most successful run ever 23 weeks. All of us are hoping for a better 2016. By May frustration was setting in on the lack of good days to play golf. If it was warm out it was raining, if it was dry and sunny the temperatures weren’t very good. But the turnout and drama was good at the French Lick Resort for the Sr.PGA Championship. Colin Montgomerie made it two in a row, and will shoot for the hat trick per-say back at Harbor Shores in 2016. In June tournament time had arrived in town, seeing Arnold Palmer at Rich Harvest Farms for the Palmer Cup was great, and so was watching the USA take the cup back from Europe. Jordan Spieth won a another major the U.S. Open and the Grand Slam watch was on. In July Spieth gave golf fans an exciting month by winning the John Deere Classic, and almost winning the British Open. At least Zach Johnson did win it, and the Claret Jug was headed for Iowa and eventually a stop at Wrigley Field. Locally the Illinois Open settled in at it’s new home where some record low scores were shot at Royal Melbourne. Then a 15 year-old won the Illinois Women’s Open at Mistwood. 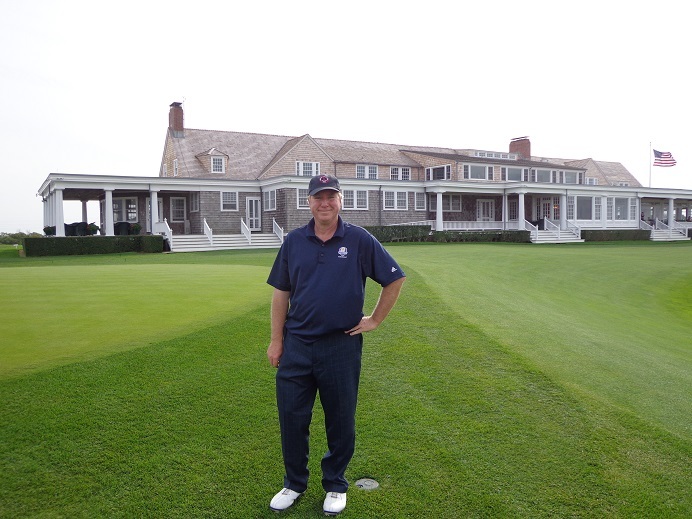 Jerry Smith won the final Encompass championship in town at the North Shore Country Club, sadly the tournament ended it’s run here as the tournaments normal June dates were given to a new Champions Tour tournament in Madison Wisconsin hosted by Steve Stricker. 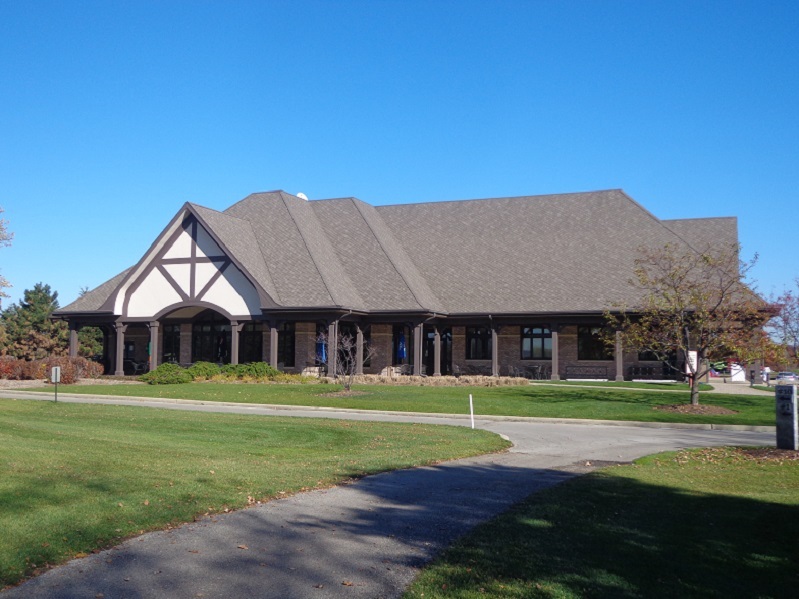 July also saw the closing of Arlington Lake GC for the summer to start a renovation by Mike Benkusky, and Oak Meadows finally closed to start the long awaited for renovation by Greg Martin. Glenview Golf Club reopened from a Rick Jacobson renovation. On July 30th Mt. Prospect welcomed the golf media to reopen the course from a David Esler renovation. August saw one of the most exciting finishes ever at the Western Amateur held at Rich Harvest Farms, when Dawson Armstrong holed a bunker shot to win on the second hole of a playoff. The following week saw Jason Day blow away the field at Whistling Straits in Haven/Kohler to win the PGA Championship. Bryson Dechambeau then came to Olympia Fields to win the U.S. Amateur in the first amateur played in the Chicago area in 18 years, and the last USGA event scheduled in town for an unknown period of time. Carrie Williams took over the Illinois PGA as Executive Director, replacing Michael Miller who departed to Arizona after 26 years in Illinois. In September the BMW Championship returned to Conway Farms and Jason Day was still on fire from his PGA win, as he blew away the field in Lake Forest. In October as the fall golf season went on, the Illinois Men’s Golf Team was winning tournaments, as they started another push for a national championship that they came so close to winning back in May in Florida. 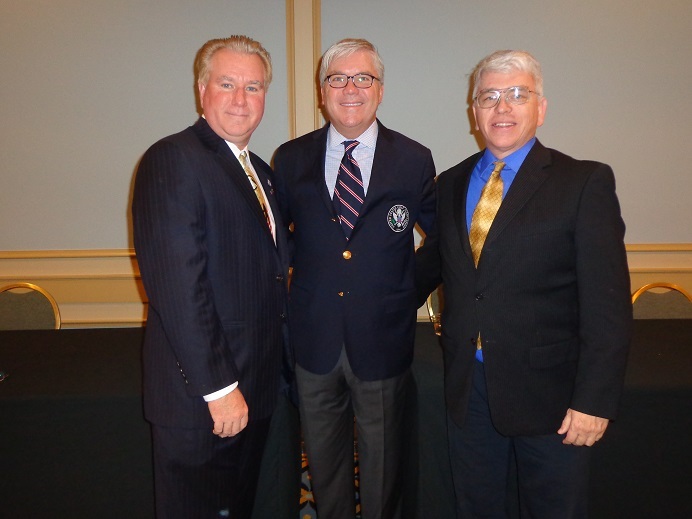 October saw the Illinois Golf Hall of Fame welcome H.Chandler Egan, Jim Sobb, Leon McNair as it’s Class of 2015. 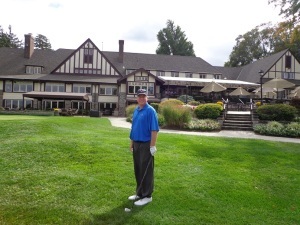 I enjoyed a golf trip to Pinehurst in North Carolina. Pinehurst the home of American Golf is an outstanding place to visit and play. If you have never been there, you need to make sure you do it at least once. Pinehurst.com for more details. November had warm weather as the fall golf season extended beyond the norm. During the month the LPGA and Rich Harvest Farms made it official they had split, and the 2016 International Crown went looking for a new Chicago area home. December still had golfers flocking to the courses with temperatures above normal and no snow on the ground. 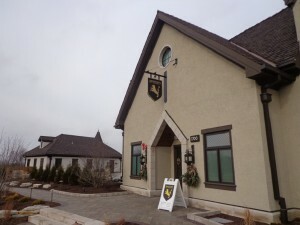 At Mistwood the new clubhouse was finally done, and owner Jim McWethy and staff were welcoming guests to McWethy’s Tavern that is expected to be a hot spot going forward from when the course reopens in April. 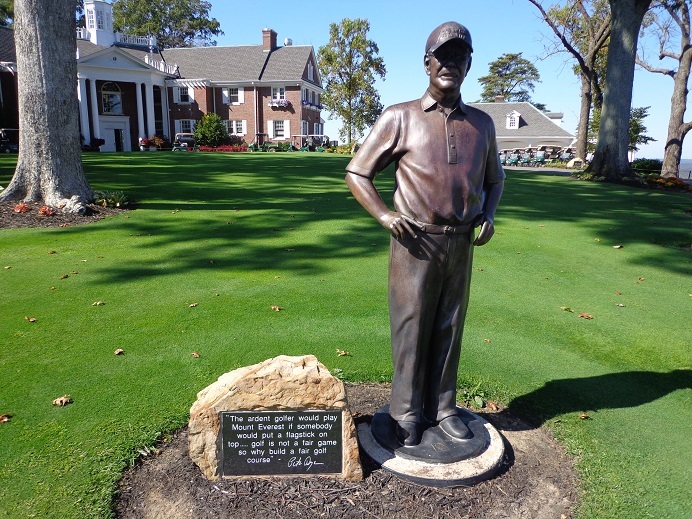 The Rust-Oleum Classic a Web.com Tour tournament, was announced for June of 2016 at the Ivanhoe Club. 2015 certainly was a year that gave us a lot of tournaments, we won’t have as many around town in 2016 to watch, hopefully it does give all of us more time to go enjoy the game and get on the tee ourselves. The Gog Blog looks ahead at 2016, this Saturday January 2nd. The Gog Blog Chicago’s #1 Online Golf News Source by Rory Spears, Editor and Director of Content. Follow Rory on Facebook, Linkedin and Twitter @GogBlogGuy. At the Rolling Green Golf Club, home of the 2016 U.S. Women’s Amateur. 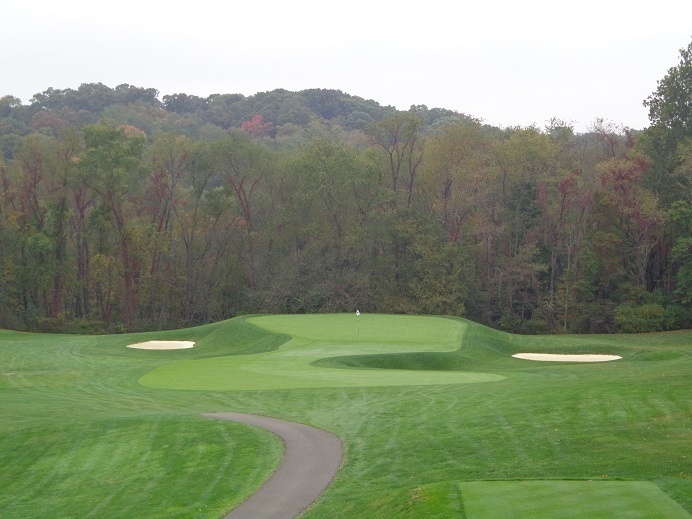 The latest stop on our Fall Classics tour is the Rolling Green Golf Club in Springfield Pennsylvania, just outside of Philadelphia. 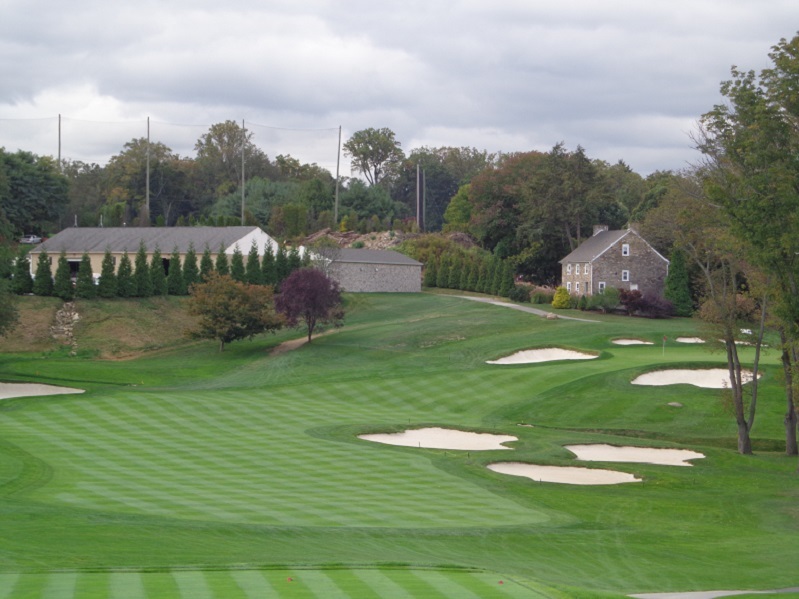 Rolling Green is classic William S. Flynn Course, that in spite of all it’s charm and the challenge that comes with playing the course, gets lost in the big picture of top rated Philly Golf, because of other outstanding courses like Merion and The Philadelphia Cricket Club. But Rolling Green with a few more big time championships, could gain all the attention it deserves. First of when one thinks of Flynn and his great works of the years, courses like Shinnecock Hills, Lancaster, The Cascades Course at the Homestead, The Atlantic City Country Club and his influence under Hugh Wilson on Merion (East Course), a course like Rolling Green can slip under the radar. It shouldn’t, and a tip of the cap or golf visor goes to the USGA for bringing the 2016 USGA Women’s U.S. Amateur to the club next summer. Workers redo greens and green collars, recapturing Flynn’s original design in preparation of the 2016 USGA Women’s Amateur. The last USGA Championship held at Rolling Green, was the 1976 U.S. Women’s Open. It was won by “Big Momma”, JoAnne Carner in a playoff over Sandra Palmer after both players had tied at +8. The playoff didn’t go much better for either player in terms of score, Carner shot a 5 over par 76, and Palmer was 7 over par after shooting a 78. All that mattered to Carner was that she won. Carner returned to the club the week before the 2013 U.S Open was played at Merion, when the club welcomed her back, and awarded her a plaque and an honorary membership to the club. Carner remembered Palmer telling her on the first tee of the playoff that she would win, a claim Palmer could not back up on that day. Rolling Green isn’t the longest course at just under 7,000 yards (6,941), but it plays longer with it’s rolling terrain and over 130 feet of elevation change. The 1976 Bicentennial Women’s Open played at just over 6,000 yards, the shortest open in modern day history. It will play longer next for the amateur, but the players will quickly find out that whatever length the USGA uses, the course will play longer. One would have to think that if the amateur plays out well in 2016, the USGA would consider bringing another U.S Women’s Open or the newly created U.S Sr. Women’s Open to Rolling Green at some future point on the calendar. With the high winning score and runner up scores that were shot in the 1976 open, members still with the club today who were there in 1976, will tell you that USGA staff told the club it would never return. While it will take 40 years between USGA Championships at the club, it’s great to see the USGA finally come back. The Par 4, 361 yard 12th hole is a signature hole, after a solid drive the approach shot must be accurate. The hole is one of the great shorter par 4’s in the country. The house in the rear was built in the 17th century. It was 1926 on the calendar when the club first opened for play, and most of the members were Quakers. They wanted a club for golf and less of a drinking atmosphere. The very limited drinking atmosphere at the proposed club, helped sell out all of the 335 memberships prior to the course and clubhouse getting finished. The club did not get it’s first liquor license until the year of 1970. The course was built on 137 acres and is spread out between tall oak, maple and sycamore trees, there are streams that wander through the course, and add to challenge. Throw in the courses rolling hills, and a golfer has plenty of things to be tested by. The course has a hand full of steep uphill holes, but enough other holes that play a little flatter. Having some local knowledge of the course really helps at Rolling Green. It’s possible at times to not realize the elevation change on some holes, until you are on the green. The record books say that par has never been broken for any major championship at the club, that was played for at least 36 holes. The longest hole on the course is the par 5, 9th hole that can play 605 yards. It is the number one handicap hole on the golf course for both men and women. Rating and Slope for the golf course measure out to 73.5 and 138. The U.S Women’s Amateur will be held from August 1 to 7 and there is no charge to attend courtesy of the club and the USGA. Rolling Green Golf Club is located at 280 N. State Road, and is about 10 miles west of the downtown Philadelphia area. The club can reached at (610)-544-4500 or through it’s website, that has a link to information regarding the women’s amateur. 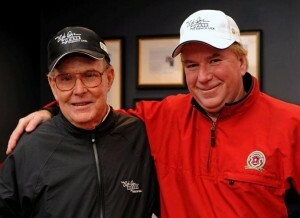 Happy 90th Birthday to Pete Dye. With Pete at the Dye Course at French Lick Resort in French Lick Indiana. The Gog Blog Chicago’s #1 Online Golf News Source by Rory Spears, Editor and Director of Content. Follow Rory on Facebook, LInkedin, and Twitter @GogBlogGuy. Tired after 17 holes and need a lift. The elevator at the Pittsburgh Field Club will provide one. 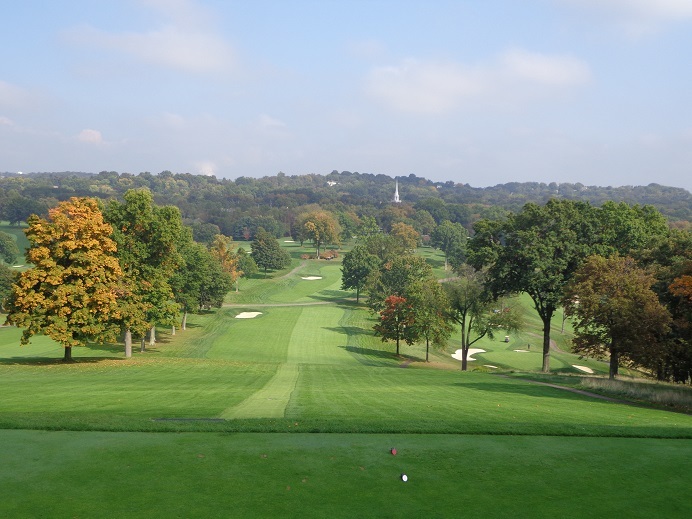 If there was ever a golf course that could give you and your game a lift, the Pittsburgh Field Club is it. The Gog Blog visited the PFC on a 36 hole day in Pittsburgh, fall of 2014. What a stellar day of golf it was. 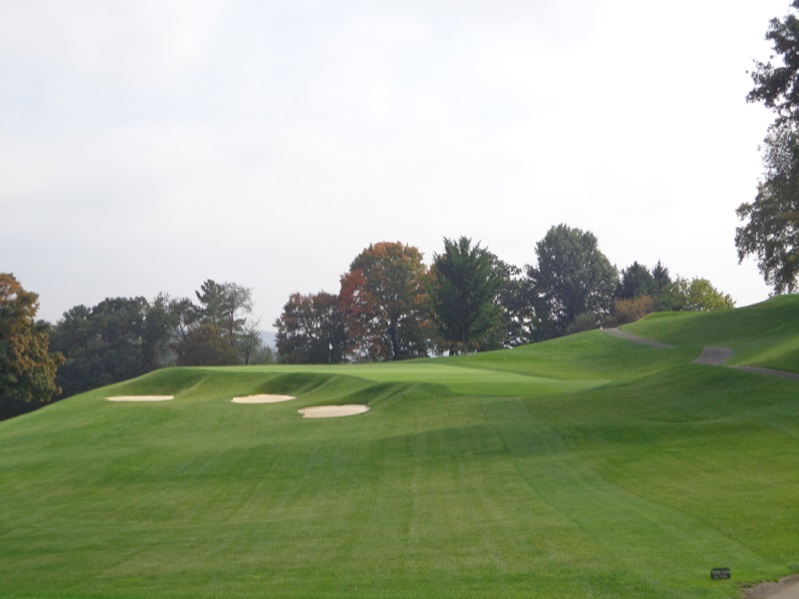 This is Part 2 of Pittsburgh area golf, a part of the country that is 6 months away from hosting the U.S. Open at the Oakmont Country Club. The Pittsburgh Field Club has a history that dates back to the 1870’s. A group of Pittsburgh area businessmen that were mostly of British decent, decided it was time for a club that would be a place for people to enjoy the game of cricket, as golf was not yet popular in America. As a result the Pittsburgh Cricket Club was founded on April 1st (no joke) in 1882. 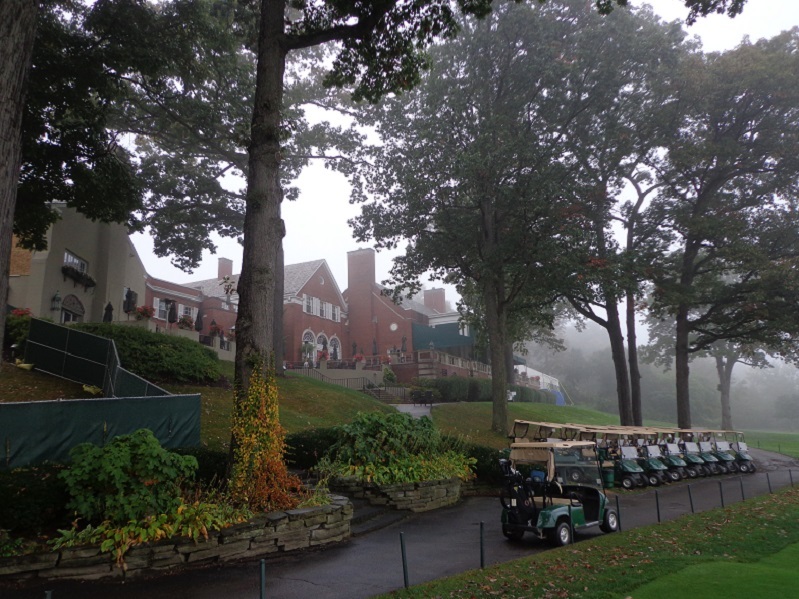 The clubhouse from the first tee at Pittsburgh Field Club. The club was originally part of the borough of Bruston, but was later annexed by the city of Pittsburgh. In addition to cricket the club soon became the place to go for archery, tennis, croquet, bicycling and track and field. By 1886 the club reorganized and became the Pittsburgh Field Club, in 1895 as interest in cricket was fading and golf was growing, three holes were built on the property. 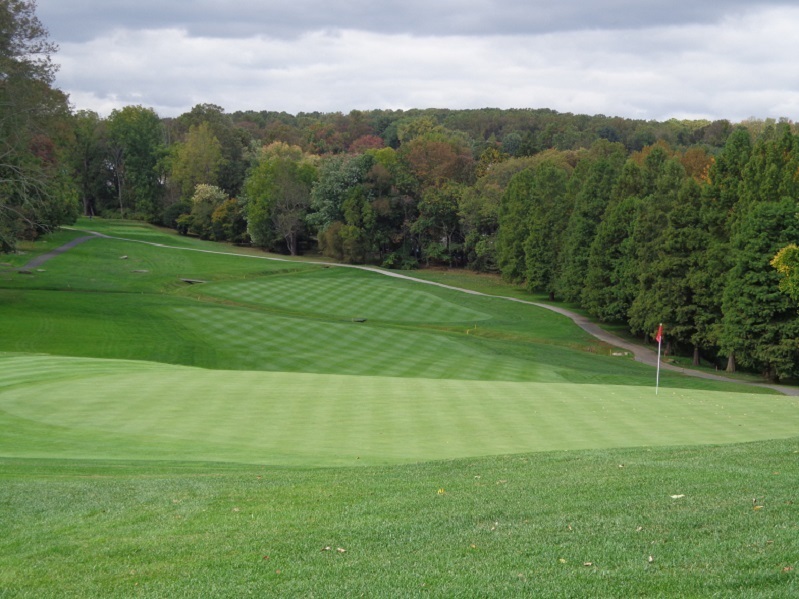 After 1900 when interest in golf started to take hold and more land was needed, the club decided to purchase 171 acres of land in an area that was less populated, and did so in the Fox Chapel area in 1915. Alexander Findlay who is known as the father of American Golf, volunteered to design the 18 hole golf course. The opening tee shot comes from an elevated tee box. The first hole at the Pittsburgh Field Club. It didn’t take long before another name in American golf came along to rework some holes, Donald Ross. Ross wasn’t the last big name architect to come along over the years to work at the field club. A.W. Tillinghast, Willie Park Jr., Emil Loeffler, John McGlynn, Bill Irvin, Robert Trent Jones, Arthur Hills, Craig Schreiner, Tripp Davis, and most recently in 2012 Keith Foster. The clubhouse had some renovation work done as well that wasn’t planned. The original clubhouse burned down in 1924 and a new one was built in 1925, with additions and modifications starting in 1959 and continuing over the years. The downhill Par 3, 14th hole at PFC. 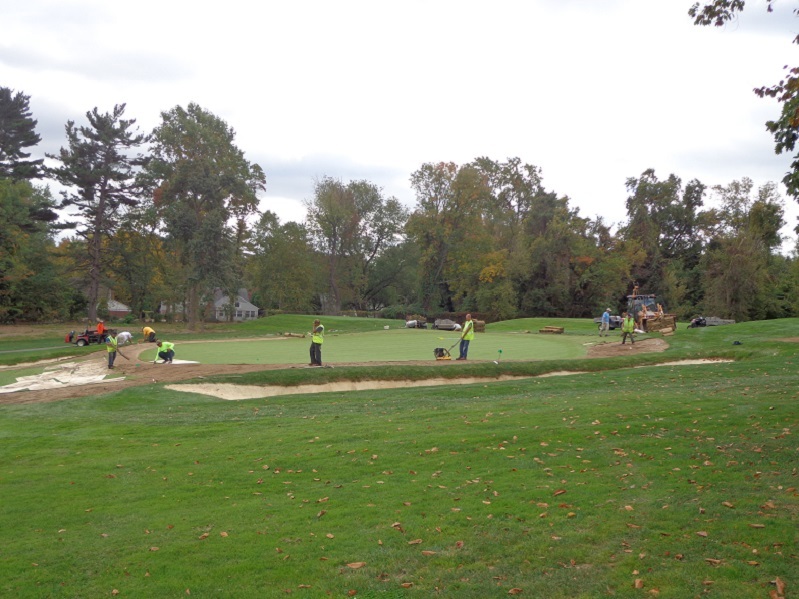 The recent bunker renovation by Foster and other tweaks to the course, have brought the club back into the spotlight. 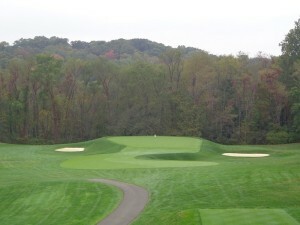 Normally overshadowed by it’s just up the street neighbor Fox Chapel Golf Club, the Field Club can now join the picture of top clubs in the Pittsburgh area. The opening tee shot provides one of the best opening views of any course in American golf. While there is no official distance given, the height of the first tee allows the golfer to see for miles. The fourth hole is a great short par 3 hole, that plays only 135 yards from the tips. The Par 3, 215 yard 18th hole that runs alongside the clubhouse. You can make an argument that the par 3, holes are the backbone of the club. All four of them are solid. In fact not many clubs in America can finish with par 3 hole and get away with it. The par 3 18th hole plays only 215 yards, but this solid design that blends into the side of the high point of the clubs property, falls off sharply left and leave the golfer with a demanding chip shot if the tee shot misses the green. The 18th hole is played after one of the great walks and rides in golf. 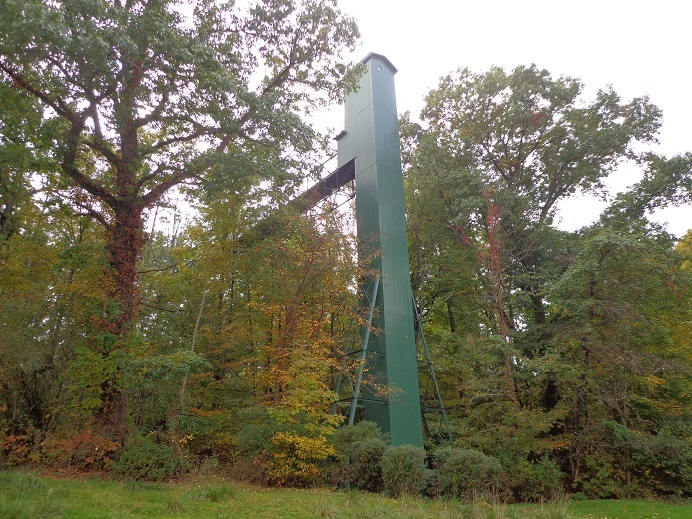 When done with the 17th hole, golfers who are walking or wish to walk to the 18th tee, can ride the elevator from down in the valley, and take the walkway out to the tee box. For more photo’s of this, see Rory Spears on Facebook and or GogBlogGuy on Twitter. The course has five sets of tee’s and plays from 6,783 yards, to the front tees of 5,290. The Pittsburgh Field Club is located at 121 Field Club Road in Pittsburgh. The club house can be reached (412)-963-8500. The Gog Blog, Chicago’s #1 Online Golf News Source by Rory Spears, Editor and Director of Content. Follow Rory on Facebook, Linkedin and Twitter @GogBlogGuy. ARE YOU READY, yes are you ready for golf in 2016. There is no reason to wait until April 1st to pull out the bag, and realize all you have is 3 or 4 low-mileage balls left 2015, your glove is still wet and rolled up from that last round of 5-6 months ago. Your golf shoes have holes in them and that head cover is still torn, and your towel is full of mud and grass stains. Do you have a few days off this week for New Years, how about heading to the golf retail store or pro shop and grabbing up some new items for the year ahead. If your buying new clubs you could start looking at what’s available, and swinging a few of them to get a handle on how they feel. Steel shafts or graphite on new clubs, you do have to decide, not today but soon. There will be plenty of demo days in the area here, after the PGA Merchandise Show wraps up on Jan. 29th. The sales reps will be back in town, with all the new clubs to show you, and let you hit them. The golf shows here in town are another place to look, Tinley Park and Rosemont will have clubs on sale and local pros and reps to talk to. Do you have that gift card to burn from Christmas, well it’s not to early to get some golf balls, or a glove now and start getting that bag together. Need a new golf bag, now is the time to find a year end sale at the retail stores or in the pro shops. use some of your off time this week to put your bag in order. It’s much better than doing it on the first tee or next to putting green on opening day. ARE YOU READY TO PLAY THIS WEEK. It’s one of the great Chicago traditions, the Eskimo Open. 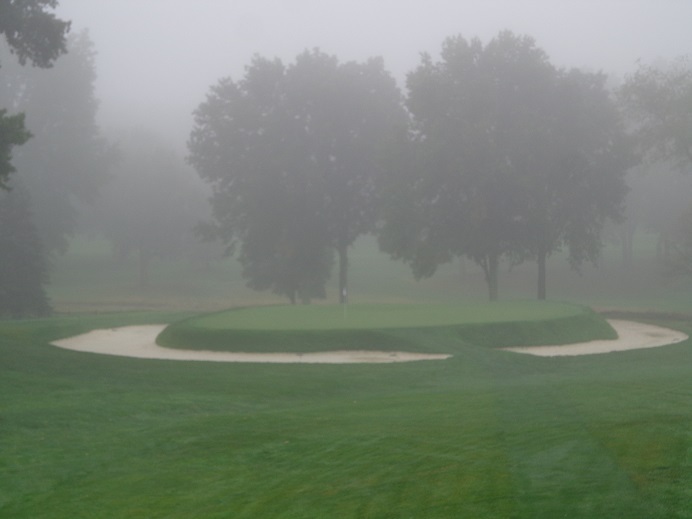 To be played this Sunday at Cog Hill on Courses 1 & 3, with tee-times starting at 7 AM. You will be in eating lunch and enjoying a beverage before the Bears kick off at Noon (if anyone still cares about them this year) if you tee it early. The weather expected for Sunday as of now is about 40 degrees and Sunny, no snow and no rain. Keep your fingers crossed. Call Cog Hill and sign up. HEADING SOMEWHERE WARM TO PLAY SOON ! Make those reservations and tee-times now. Florida might be warm this time of year but it still gets dark early there like it does here. There are many more golfers and only so many tee times. 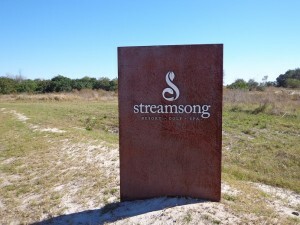 Places like the Streamsong Resort in between Orlando and Tampa fill up quickly, so does Innisbrook, Reunion, Bay Hill, Hammock Beach and Doral. If your headed west like Arizona about the time spring training starts, those courses fill up quickly and so does Hawaii especially when all the tours descend for their events. In the mean time. Our golf domes are open, do go out and hit some balls. Work on the putting and chipping as well. Get a handle on when the demo days are coming and or other special events. 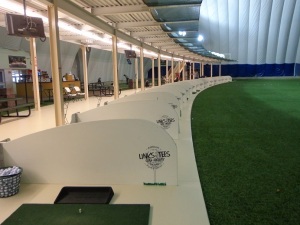 All of the domes have targets on the floor or hanging from the roofs, great time to work with those wedges. It’s great to be hitting it close all summer when you are out about 50 to 125 yards from the green or the stick. The Gog Blog Chicago’s #1 Online Golf News Source by Rory Spears, Editor and Director of Content. Follow Rory on Facebook, Linkedin and Twitter @GogBlogGuy. By the 9th green at Shinnecock Hills on Long Island. Welcome to a new Gog Blog segment called fall classics. No it’s not the World Series of Golf, but it is a recap of some fall rounds of golf I’ve played over the last couple of years. 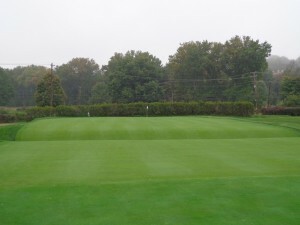 There are some courses that are treat to play anytime of year, there are more that are really special to play in the fall time of year for several reasons. One they aren’t as crowded, two the weather is nice, a little cool maybe but not cold and not a scorcher from summer heat. In the fall depending on where you play, the colors from that time year but a course in a whole new light. Hopefully you don’t spend all day looking for your ball in the leaves, or invoking the leaf rule. If the course is not crowded, it can just be a pleasant walk where you get lost in your thoughts or maybe your game kicks in after a long summer of adjusting to new equipment or a series lessons from the pro. Either way most golf purists will tell you that fall golf is best the time of the year to play. The club house at Fox Chapel Golf Club in Pittsburgh, picture from the first tee box. In the next couple of weeks, I hope you enjoy our series of fall classics. Our winter special of “Great Golf on Cold Day” will return when the temps really start falling and the snow we still don’t have starts to pile up. RS. Pittsburgh area golf, Part 1. Pittsburgh area golf. 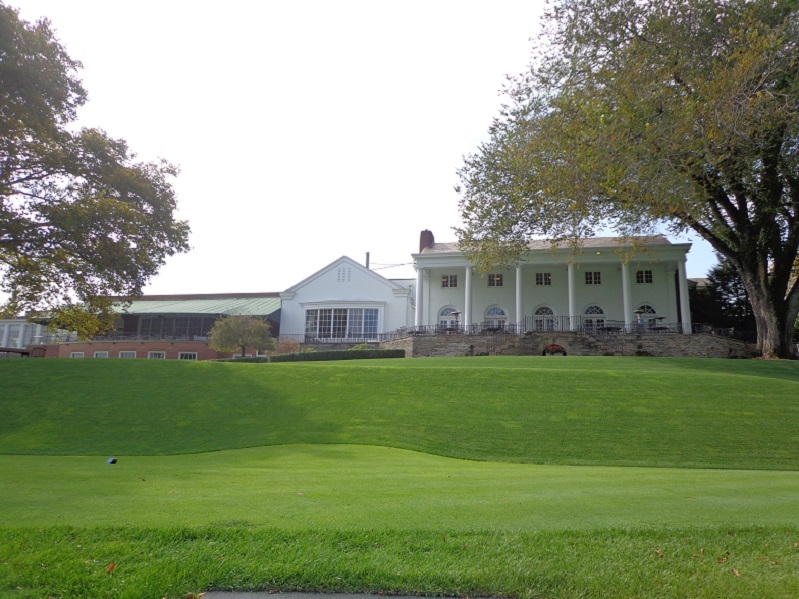 In 2016 when the U.S. Open comes to Oakmont Country Club, all the other golf action in town will be at Fox Chapel or it’s neighbor down the street the Pittsburgh Field Club. As you will see, all the great golf in Pittsburgh is not at Oakmont. The Par 4, 5th hole is called “Cape”. Not a long hole, but strategy is involved. It was 1923 when a group of men from the Pittsburgh area decided it was time to find land for a new golf club. the group of 50 quickly raised $152,000 on the first night. Land had been found in a valley that was just what the group of 50 had hoped to find. Work started in May of 1923 on the golf course by architect Seth Raynor who was know for his work at National Golf Links on Long Island. 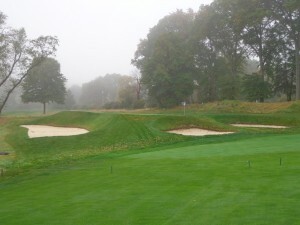 As a result many of the Fox Chapel have features similar to holes at National. 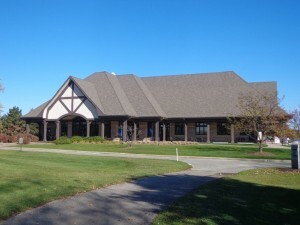 Alden and Harlow were the architects who designed the clubhouse. From an elevated tee box, the par 3 11th hole called “Short” just 155 from the tips, is one of the great par 3’s anywhere. Due to poor weather conditions, it took until June 13th of 1925 for the course to be opened. On the date a four-ball match was played. Based on cost estimates the club elected to spend not more than $120,000 to build the cost. But when it was done, the cost was $220,000. But the course was found to be good, and well liked by the membership. It didn’t long for the clubhouse to be deemed to small, and most of it was torn down for a bigger structure. No sooner than the clubhouse was completed on Memorial Day of 1931, than revenue shortages hit the club because of the depression. 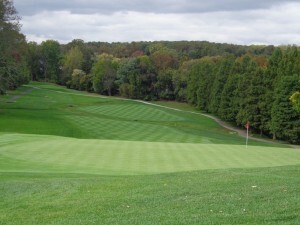 The par 4 15th hole at Fox Chapel Golf Club. The clubhouse has remained mostly the same over the years, with a few additions over the years. The latest addition and work being done was during our visit in 2014, that did include work on the pro shop. In time both tennis and swimming became part of the club, including a shooting lodge in 1927. The lodge was re constructed in 1989. 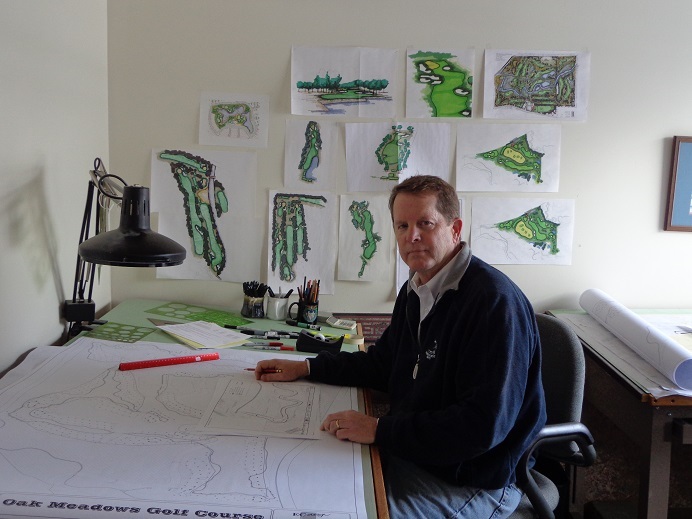 In the mid-1990’s architect Brian Silva was brought in to work with the clubs green-committee to restore much of Raynor’s original intent for the course. The club served as host for the Curtis Cup in 2002, and in 2012-2013-2014 it was home to the Senior Players Championship, and was very well received by the players in the field all three years. One great par 3 deserves another. The par 3, 17th hole at Fox Chapel is a Biarritz style green. It plays a solid 231 from the tips with bunkers left and right, hitting the green with your tee shot is not enough if your on the wrong side of the green from where the pin is located. What will come next in terms of a tournament for the club is unknown as of now. But if Fox Chapel wants to hold another tournament of championship again in the future you can bet that the USGA or another golf organization will come calling. Golfers from the Midwest who have played or been to clubs like Shore Acres north of Chicago or the Blue Mound Golf Club in the west suburbs of Milwaukee, will understand the design of Fox Chapel. The course is one of the great classic challenges in the sport today, and has been ranked on many Top 100 lists by various publications over the years. For more information on this great historic club visit Foxchapelgolfclub.org. Here’s hoping you had a great Christmas and Santa or your friends and family got you some of the golf needs you had on your list. CATCHING UP BIG 3 partner Tim Cronin has posted an Autumn, Fall, Winter edition of his online Illinois Golfer. You can punch it up at Illinoisgolfer.net. Tim has included a recap of the BMW Championship, the Illinois Golf Hall of Fame Dinner and induction ceremony. A recap of the press conference at the Ivanhoe Golf Club for next years Rust-Oleum Web.com Tour Championship. 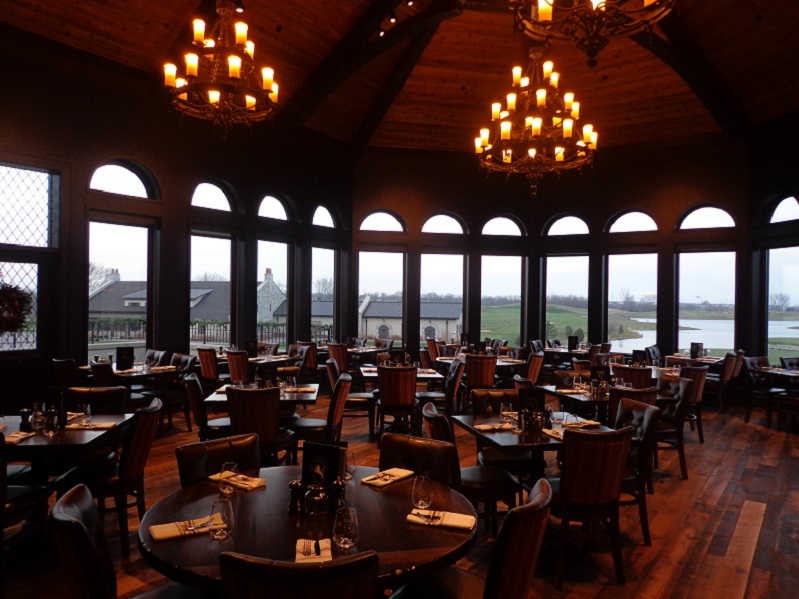 A preview of the new McWethy’s Tavern at the Mistwood Golf Club in Romeoville, and more. 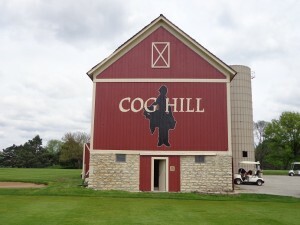 Cog Hill in Lemont, they are open. Cog Hill in Lemont is open today and every day. Courses 1&3 are open, call to check on Course #2. The driving range is open to test your your new clubs if you already have them and you aren’t up a round of 9 or 18 holes. THIS WEEK, begins sign up for the Eskimo Open on Sunday January 3rd. 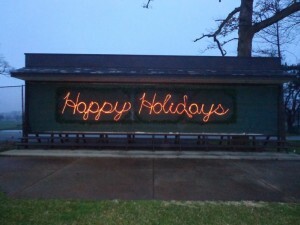 See Coghillgolf.com for all the details. Architect Greg Martin in the design studio. ARCHITECT Greg Martin continues to stay busy on the renovation front. The Batavia based Martin, who will be hard at work at Oak Meadows this summer. Is now under contract for projects at Orchard Valley GC in Aurora, and at River Forest CC in Elmhurst. Martin will be reviewing the practice area’s at Springbrook in Naperville as well. Oak Meadows is targeting a spring of 2017 reopening, with it’s new design. IN WISCONSIN, they are open for golf today at the Bull at Pinehurst Farms, just south of Kohler, visit their website for more details. Their Christmas Sunday brunch is on for tomorrow. WANDERBAT.Com has named Eugene Country Club in Oregon the No.1 course in Oregon and the 8th best course in the United States. Eugene Country Club will host the NCAA National Championships this coming May and was originally design by Robert Trent Jones. Some improvements have been made to the course in preparations for the NCAA Championships under architect Jackson Khan. Finally some courses are open, check with the pro shop or on line. Happy Holidays RS. FROM ALL OF US AT GOLFERS ON GOLF… Mike Munro, Ed Stevenson, Bill Berger and Rory Spears. 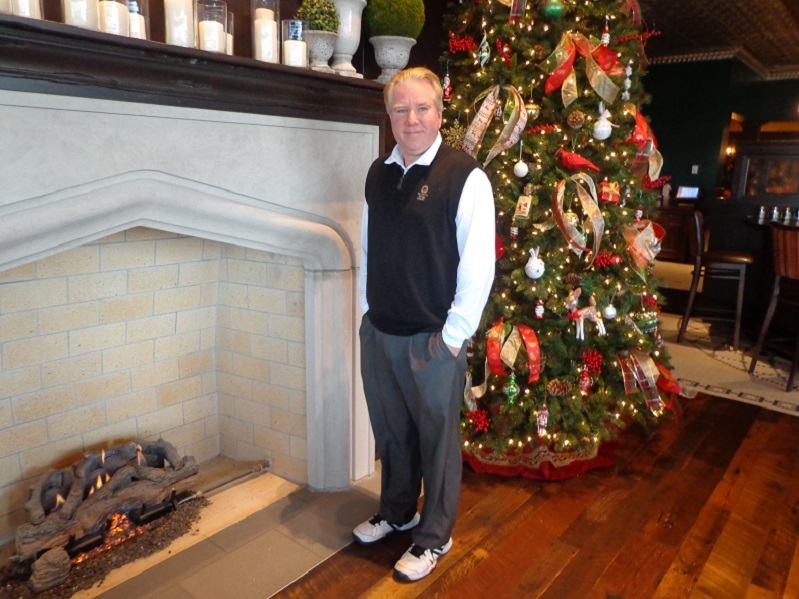 Yes the holidays are upon us, on left Throw Back Thursday from 2014, on Right by the new Christmas Tree at McWethy’s Tavern in Mistwood Golf Club Romeoville. The sign at Cog Hill says it all. Merry Christmas everyone. 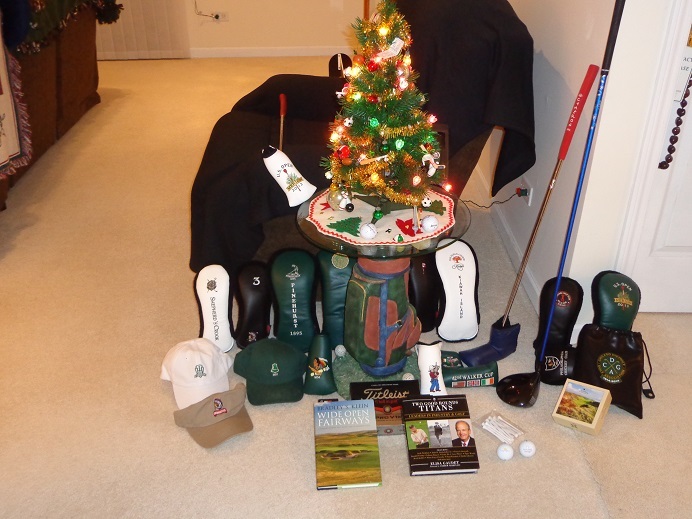 Some final thoughts on Christmas and Golf. If you get new clubs tonight or tomorrow and are anxious to try them out. You can on Saturday, Cog Hill will have at least courses 1 & 3 open and a few courses will be open as well. Call the pro shops before going. It will be chilly this weekend, but with no snow on the ground some clubs will let you play. If you get money or a gift card towards getting clubs or shoes etc., it isn’t mandatory to spend it all this weekend. If your budget gets you a deal that works for you, by all means get what you want. But remember the PGA Merchandise show is coming up late in January, and many new products will be available for order or in the stores and shops right after the show. So you can wait a little and still have the new stuff by the time your course opens in late march or early April. Finally do thank the people in your life who have found you golf gifts, they do care if they are getting you golf gifts. Merry Christmas. The Gog Blog returns on Saturday. 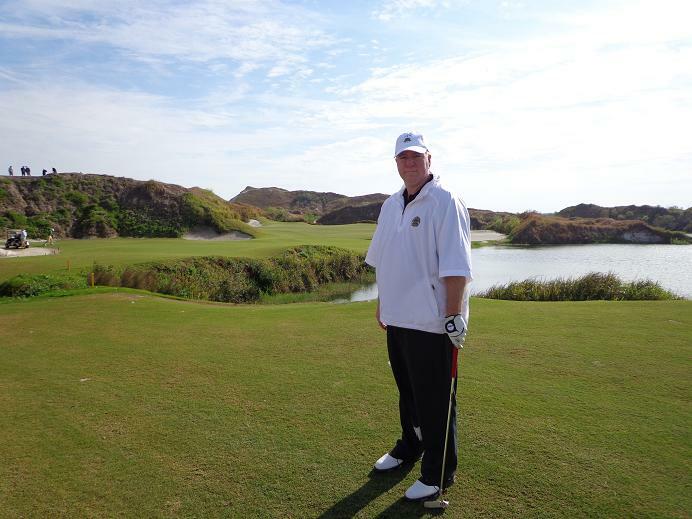 The Gog Blog Chicago’s #1 Online Golf News Source by Rory Spears, Editor and Director of Content. Follow Rory on Facebook, Linkedin and Twitter @GogBlogGuy. 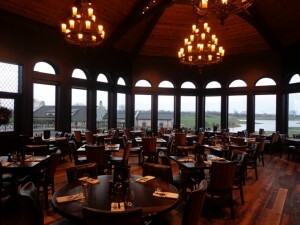 At McWethys Tavern in Mistwood GC, Romeoville. The holidays are no longer just closing in, they are here. Did you get your golf gifts for yourself or your favorite golfer yet. Last day is tomorrow, some golf stores and pro shops are open, until early afternoon. The golf domes are open until early afternoon as well. 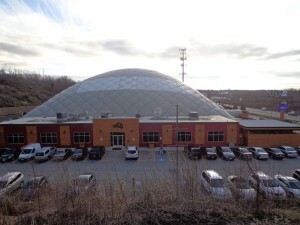 MCQ’s golf dome is open tomorrow from 8-3, and closed on Friday, back open on Saturday morning at 8 AM. 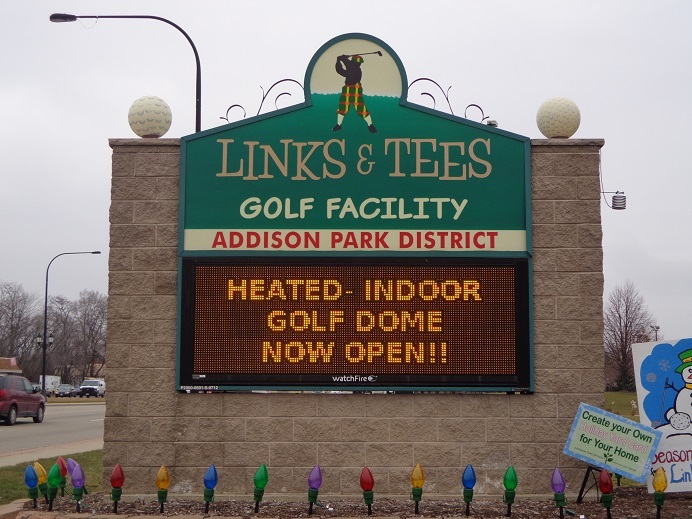 Links and Tee’s on Addison is open tomorrow from 8-4 PM and closed on Christmas Day, it reopens on Saturday at 8 AM and is open until 10 PM, and then 8 to 8 on Sunday. 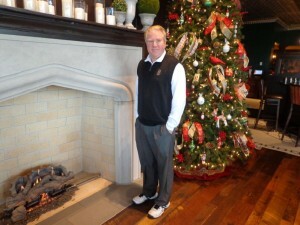 The Gog Blog Chicago’s # 1 Online Golf News Source by Rory Spears, Editor and Director of Content. Follow Rory on Facebook, Linkedin and Twitter @GogBlogGuy. With two flashy guys at the Halfway House in Elmhurst. You might not have heard of the newest golf place in the Chicagoland area, it’s called Halfway House indoor golf. Halfway House indoor golf is located at 555 S. York Street and it’s part of the HB Jones Restaurant Building. It hasn’t been open long, but owner Susan Phillips says you will be hearing more from them soon. But why wait ? You can go over there today and play some indoor golf. Yes bring your own clubs if you have them, but don’t worry your covered if you don’t. Where do you want to play, you have your pick of some 90 courses from around the USA and a few more from around the world. Halfway House indoor golf owner Susan Phillips, hopes you will bring your clubs and your favorite foursome and try out the simulators. If your hungry or need a beverage while teeing it up at Halfway House Golf, the good news is that all of that can be brought right over from HB Jones. So why not enjoy the indoor concept of golf. How it works. When you gather around the table behind your simulator with your group, it’s almost like going bowling. Gather around the alley,let everyone take their shot and then it’s your turn again. Scoring, you don’t even need to worry. The simulator does it all, so when your not hitting, enjoy the conversation with family and friends. 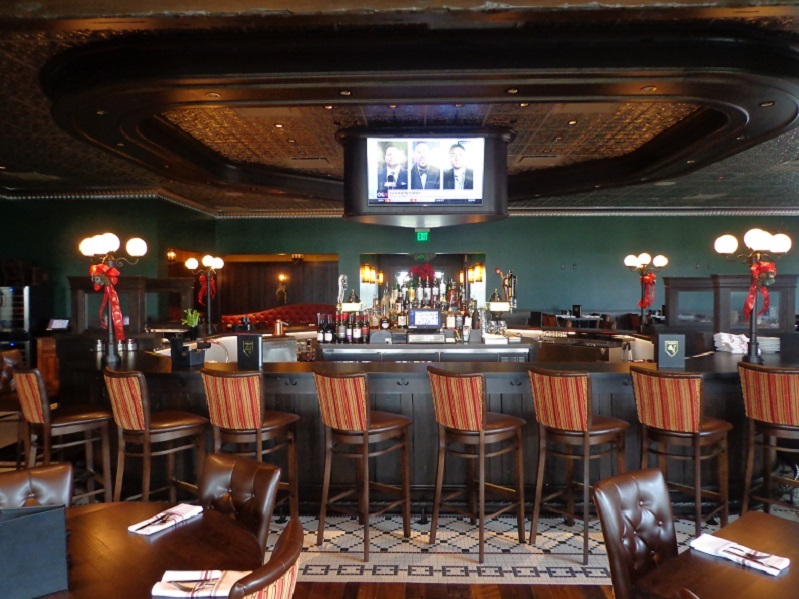 Check out the game on the TV’s all around you, enjoy your burger, beer and other treats. Not a beer drinker, the freshly made malts look really tasty and the junior golfers in your group will enjoy them. Multiple groups are enjoying the golf, and more at the Halfway House. 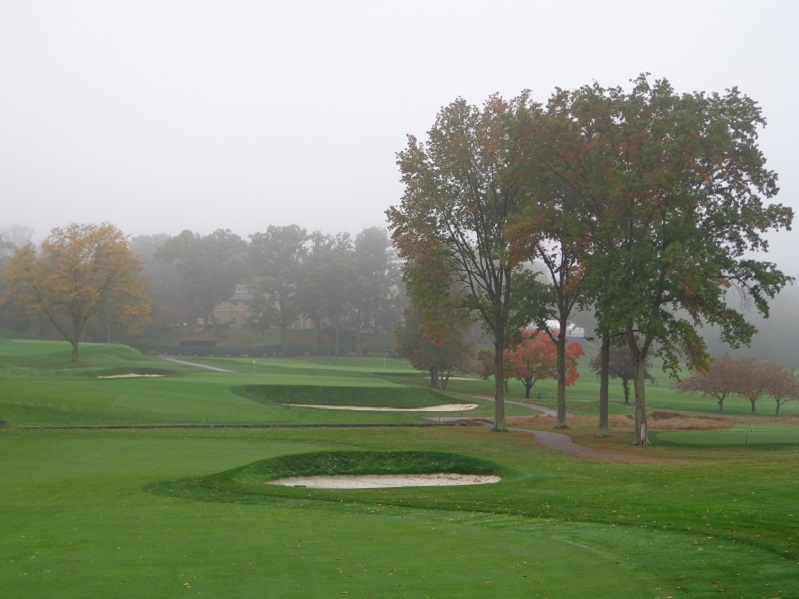 If you want to play local courses, you can jump on and play Dubsdread or Course #4 at Cog Hill in Lemont. Want to play a U.S Open course. You can do that because there are several, like Pinehurst No.2, Bethpage Black, Pebble Beach. When your done at Pebble Beach, dial up Spyglass Hill that sits just down the street from Pebble Beach out in Carmel. 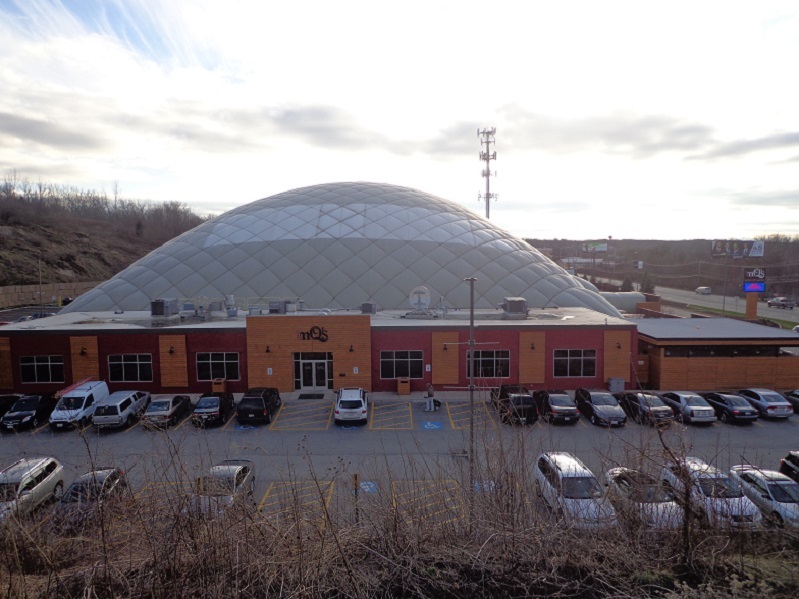 So if your ready for a winter golf workout, go hit some balls in the dome, then head over for your match with friends at the Halfway House on York Road in Elmhurst. 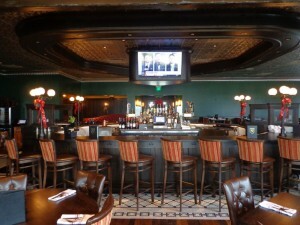 Part of the DB Jones Restaurant. Play solo, or bring a partner or a foursome or more, anyway amount of players will be fun. HOURS: Sunday 7A-9PM, Monday 3PM-9 PM, Tues. Noon-9 PM, Wens. Noon-9 PM, Thurs. Noon-10PM, Fri. Noon-11PM, Sat. 7A-11PM. 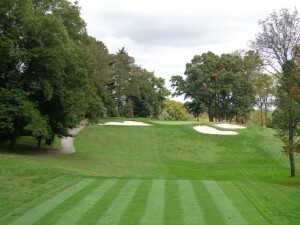 For more information you can call (630)-331-642-8050 or visit online HalfwayHouseGolf.com.